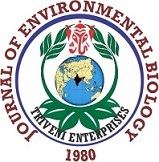 Aim: The present study aimed to understand the periodical changes in fine root biomass, production, turnover and carbon and nitrogen return in forest fallows following shifting agriculture in Mizoram, Northeast India. Methodology: Root biomass was determined using sequential coring method in different fallow lands (FL-3, FL-5 and FL-10) following shifting agriculture. Annual fine root production was calculated as the sum of differences between annual maximum and minimum root biomass of different diameter classes. Concentrations of carbon and nitrogen in soil and roots were determined using CHN auto-analyzer, and their accumulations and returns were computed as the product of mass and element concentrations. Results: Total root biomass was maximum (561 g m-2) at FL-10, which decreased to 141 g m-2 at FL-3 with greater accumulation of fine roots in upper soil layer (0-10 cm) and coarse roots in lower depths. Root biomass was maximum (1499 g m-2) at the time of slashing which decreased to about one fourth just after burning. The amount of organic matter, carbon and nitrogen return to soil through fine root death was significantly regulated by soil moisture, microbial biomass carbon and total nitrogen in different fallow lands. Interpretation: Addition of organic matter, carbon and nitrogen to soil through death and decomposition of fine roots is an important mechanism responsible for sustaining soil fertility and crop productivity in different fallow lands. The output of the study has implications for the management of fallow lands following shifting cultivation and modeling global cycles of carbon and nitrogen.